Notting Hill is only a 15 minute drive from the gorgeous downtown San Antonio. Notting Hill offers easy access to IH10, Loop 1604, and Loop 410. 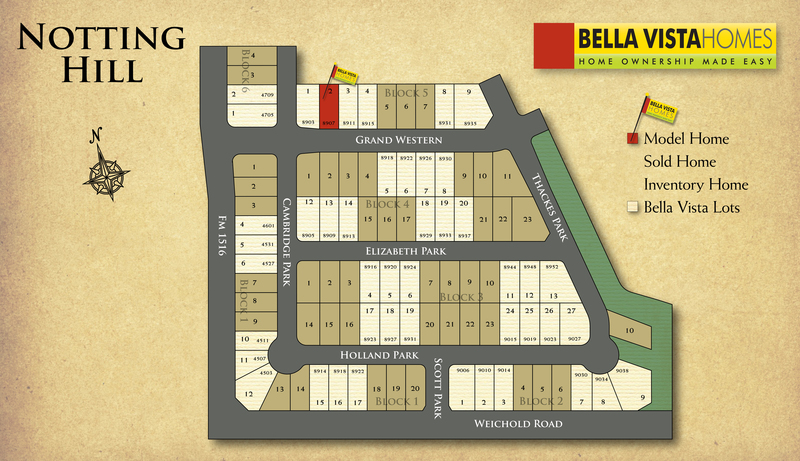 Homesites are available! This floorplan is brand new and very versatile. The main floor consists of a study, family room, and large open kitchen with a great dining room. The grand kitchen includes stainless steel appliances with a gas range, 42" upper cabinets, upgraded tile backsplash, and an upgraded Moen faucet. The study has french doors and vinyl wood plank flooring. Expect to see tile floor in all wet areas and family room. The master bedroom and additional bedrooms are located upstairs along with a large game room. This home offers beautiful tray ceilings in the master bedroom as well. This home is complete with a zone damper system, water softener pre-plumbing, and 2" wood faux blinds. pre-plumbing, zone damper system, and 2" wood faux blinds. 36” Flat Panel Legacy® cabinetry with Crown Molding, hidden hinges, and adjustable shelves. Staggered cabinets above the range.